One woman from Akron, Ohio, went through something no mother should ever have to: she lost her son at the tender age of 25 to a drug overdose. But she wasn’t ashamed to tell her son’s story and chose to channel her heartbreak into helping others. And it all started with the young man’s obituary. Michelle Benson is the Ohio woman with a poignant story, having lost her 25-year-old son in the most tragic way. 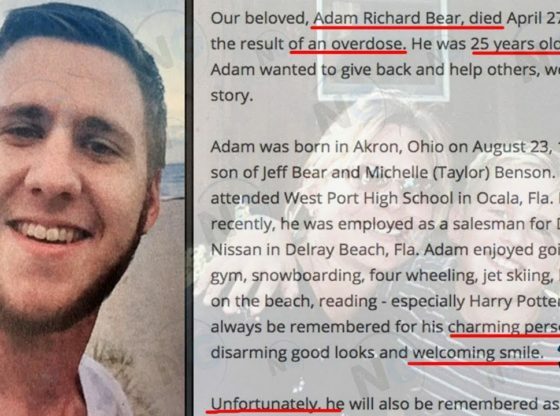 His name was Adam Bear, and he had been struggling with addiction. Sadly, though, that addiction would eventually take his life in April 2017. According to Benson, her son was an active person. In particular, Bear was keen on snowboarding, jet skiing and hitting the gym, among other hobbies. And he was also an avid reader, with a particular penchant for the Harry Potter series. Not only that, but the good-looking and amiable Bear potentially had a bright future ahead of him. After Her Son’s Life Ended Much Too Soon, This Mom Wrote A Chilling Obituary About His Life On February 12, 2019 By Akron-Canton City Guide One woman from Akron, Ohio, went through something no mother should ever have to: she lost her son at the tender age of 25 to a drug overdose. After Her Son’s Life Ended Much Too Soon, This Mom Wrote A Chilling Obituary About His Life. Next Berardis Family Kitchen – Sandusky Ohio Restaurants. Leave a Reply Cancel reply. And judging by the comments written below Bear’s online obituary, it was clear that people were grateful for Benson’s honest account of her son’s life. “God bless you for bravery, honesty compassion and care in writing such a beautiful tribute to your handsome son,” one person wrote. And although Benson’s story resonated with those who had lost loved ones to drug overdoses, her main aim was to get through to people who still had a chance to act. It may have been too late for Bear, but by telling others about local resources available to drug addicts, she could save lives. After Her Son’s Life Ended Much Too Soon, This Mom Wrote A Chilling Obituary About His Life. Home / Akron Travel / After Her Son’s Life Ended Much Too Soon, This Mom Wrote A Chilling Obituary About His Life. Akron OH. Akron Travel | February 12, 2019. And it all started with the young man’s obituary. Image: Facebook/Adam Bear Michelle Benson is the Ohio woman with a poignant story, having lost her 25-year-old son in the most tragic way. Unfortunately, Bear was one of the unlucky ones who overdosed on the illegal substance. According to his mom, the 25-year-old “never stopped fighting [his addiction],” but in the end it got the better of him. “He certainly didn’t win that battle,” his mom told News 5 Cleveland in May 2017. As a result, Bear died on April 27, 2017. Mom’s Heartbreakingly Honest Obituary For Her Young Son. There’s no question that 25-year-old Adam Richard Bear’s life ended too soon. His grieving mom, Michelle Benson, recalls the gifts from God that made Adam special. But she doesn’t try to hide the terrible drug addiction that robbed him of everything.